I wrote nearly 20,000 words in the first three weeks of November. 42 single spaced pages written in 11 pt. font. It is about half the length of my current work in progress, a romantic comedy novella… the sequel to my first book for adults. I feel pretty darn good about that accomplishment. I was able to manage this feat through the use of two strategies, and I want to tell you about them, so you can replicate my success. The first thing I did was create a loose outline. I talked more about this process in a previous blog post that you can check out… but basically I took a stack of note cards, wrote one possible story event on each card and then arranged (and rearranged) the cards until I was happy. Then, it was time to sit down and write. Because I have a tight (self-imposed) deadline for my current work in progress, I knew I couldn’t sit down and wander through my story. I needed to get the words on the page and fast. So, I decided to try a writing sprint. Rest easy, it has nothing to do with running! 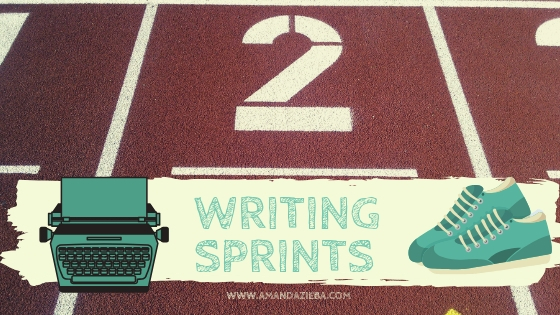 A writing sprint is a timed work session in which you devote extreme attention to your writing task. 1. Set up your work environment with the tools you need. For me, this was my computer, outline, research documents and YouTube playlist. If you need caffeine, make sure that is with in arms reach as well! 2. Set your timer. I chose 30 minutes. A half and hour gave me enough time to get in a good writing flow, but was not so long that I tired out and wanted to quit. This time constraint was short enough that I didn’t want to waste even a minute checking my email or social media. I didn’t have time! Thirty minutes was also a short enough time that I could find pockets of my day in which to squeeze a sprint. 3. Set an intention for your writing time. What event do you want to chronicle? What emotion do you want to convey? What obstacle do you want your character to overcome? Think small. Think bite sized. What do you want to accomplish in one chapter of your work? 1. Close all tabs except your writing document. This way you won’t be tempted or distracted by the black hole of the internet, or the notifications on your social media platforms. 2. Turn off the volume on your phone. Or, at the very least, turn it over, again, so the flashing notifications don’t rob your attention. If your phone does ring, and it’s not an emergency, don’t answer it. Call back in 30 minutes, or 17 or however many are left on your timer. 3. Speaking of timer. USE ONE. This way you don’t have to remember what time you started and what time you should be done. A timer prevents you from losing track of time and writing for longer than you intended, making you late for the rest of your day. It also makes the writing sprint feel like a game or contest. Another writer I know created this website as a tool to fuel writers in just that way. Here you can race other writers and the clock… and consequently raise your word count in a hurry. 1. I had a basic story plan in my head. I wasn’t totally making things up on the spot. I had a rough idea of where I wanted to go, I just needed to put in the miles, so to speak. 2. I was motivated. I really, really, really want to get this project done (as in self published and out in to the world!) by Valentines Day. It’s almost December. I don’t have time to dilly dally. 3. I followed my own rules. Sorry Mom, one time you called, and I didn’t answer. I was writing! My browsers stayed closed. I used the timer function on my phone to stay accountable. And I wrote. 4. I also forced myself to stop at the thirty-minute mark. Sure, I finished a sentence, but I didn’t finish the chapter. While I was away from my screen, teaching, driving, working on something else, my brain was busy thinking about my story. This made me a little antsy, but also really excited to get back to my story. 5. I was motivated by my own success. My first attempt at a sprint yielded 700+ words, the second, 800+ and the third for the day… over 1,000!!! Tell me the last time you wrote over 2,000 words a day!! Until I tried sprints… I couldn’t! Often times in the past three weeks I would sprint once I dropped my boys off at school, or just before lunch. Sometimes I arrived to campus early, or class got done a little sooner than I thought and so I was able to squeeze in a quick sprint. Maybe you are a night owl and write before you go to bed, or an early riser and do your sprint as you enjoy your first cup of coffee. It doesn’t matter! You can sprint any time! Figure out what works best in your world/life/schedule and then… WRITE!